코파카바나 비치에서 단 450m 거리에 위치한 Merlin Copacabana는 일광욕 테라스가 딸린 옥상 수영장을 보유하고 있습니다. 풀사이드 바에서 바다가 내려다보며 열대음료를 즐기실 수 있습니다. Wi-Fi를 무료로 이용 가능합니다. Copacabana Merlin의 객실은 에어컨을 갖추고 있으며, 대서양림(Atlantic forest)과 코파카바나 중심가 전망을 자랑합니다. 객실에는 케이블 TV와 금고가 완비되어 있습니다. 객실은 현대적인 장식으로 꾸며져 있으며, 넓은 공간을 제공합니다. 신선한 과일, 빵과 냉육으로 구성된 조식 뷔페가 매일 제공됩니다. 호텔의 레스토랑에서 점심과 저녁 식사 시간에는 브라질 요리를 비롯하여 세계 각국의 특선 요리도 선보입니다. 투어 데스크에서 당일 관광 및 여행 상품을 이용할 수 있으며, 24시간 운영되는 리셉션에서 렌터카를 예약하실 수 있습니다. 해변에서 더욱 편안한 시간을 보내실 수 있도록 수건과 비치파라솔을 제공합니다. Merlin Copacabana Hotel에서 카르데아우아르코베르지(Cardeal Arcoverde) 지하철역은 750m, 산토스 두몽 공항은 7km, 갈레앙 국제공항은 23.8km 거리에 있습니다. 코파카바나 요새는 단 3.8km 떨어져 있습니다. Merlin Copacabana에 숙박 예정인 투숙객의 명의로 된 신용카드로만 예약 가능합니다. 투숙객을 대신한 제3자는 이 호텔을 예약하실 수 없습니다. 호텔은 추가 정보 요청을 위해 투숙객에 연락할 수 있으며, 투숙객은 체크인 시 예약에 사용한 카드를 제시하셔야 합니다. 어린이는 트리플룸에 한해 숙박 가능합니다. I messed in booking by mistaking 1 adult instead of 2. I email hotel asking for updating. They responded right away giving additional guest without charge. I was appreciated of their understanding and flexibility. The Hotel is very clean and staff are friendly. The hotel is close to many attractions such as "sugar loaf Mountain" and Copacabana and Ipanema beaches. The breakfast was good enough to start your intensive day visiting Rio. 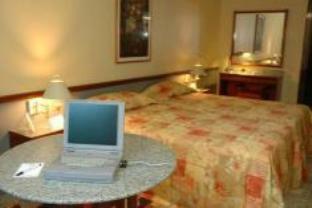 The hotel is well equipped, the rooms are really big and the staf was very friendly and helpful. We were a group of 10 people and spent 3 days. The staff was very helpful, responded with a smile to all our requests. Good location just off Copacabana beach. hotel was in a good location only a few minutes from copacabana beach and within walking distance of sugar loaf cable car. spacious room, although basic. the day staff were very helpful in organising carnaval tickets, taxis, giving directions etc. nice small pool terrace on the roof of the hotel. the price of the hotel over doubled during carnaval weekend, which did not feel good value, but was otherwise good value for good location. location also a short walk to shopping mall with great food court. Central Aircondioner pumps tobacco smoke from same floor rooms into yours. location of hotel is great for shopping and close to the copacabana beach.sightseeing tours offered by the hotel cost in average a lot more as same tour are sold by nearby travel centres.the tobacco smoke entering our room from rooms on the same floor through the aircondiion system on the other hand is more serious as the hotel claims it is a non smoking hotel. location is good to walk to Sul Shopping central and to the beach. Hotel location is quite good . It is near by the beach. We can walk only 5 Minutes to Copacabana and Sul shopping centre. It is also close to the bus stop. You are also to take subway at a nearby station to Rio Center. However the bed and lenins in room are not a good quanlity.Breakfast is just survival. We had a great time at this hotel. This was our first trip to Rio (mother & teenage daughter) and the location was perfect for us. It is a very short walk to the beach and there are also many other things in easy walking distance. The nearby grocery store was handy - altough with included huge breakfasts and great dinners easily avalable we just got water & the odd thing for lunch. THe pool was smaill (although consistent or even good for Rio standards) but was handy for a late dip or for days when the weather was a bit uncertain. We ate more at the hotel than we originally planned since it was so convenient and great. The buffett/Dinner was very good in choice and quality. Staff friendly, Bedrooms was comfortable as well. The location is not too good in terms of where beech is located, and is about a 10 minute walk away. I would recommend this hotel to anybody, providing if you do not mind the 10 minute walk to the beech. The standard and quality of the hotel was very good when comparing to western standards. We all enjoyed our stay very much. We would definately come back here again. The hotel is ideal for small children and families. 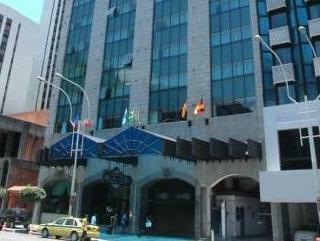 Very good location, 5 minute walk to Rio Sul Mall and Copacabana/Leme beaches. Friendly staff and decent breakfast provided. Pool attendant seemed to never be there ... hard to get a towel. This hotel was very good value for the price we paid. The room was simple, yet spacious and comfortable. The hotel is also in an excellent location, close to shopping, the beach, and right along a major bus route. The rooftop pool was also pleasant, although we were only once able to get towels as the attendant was rarely there. We were very pleased with this hotel given that we paid only $90 US per night. Although the bed was a bit uncomfortable, the room was spacious and clean. The location of this hotel is excellent if you wish to combine both the beach and Rio's other attractions, as it is along major bus routes. Location very good. Nice restaurant, good breakfast. The swimming pool was closed due to renovation. We were disapointed that this was not said in the description of the hotel. We have stayed at the hotell many times when we have been in Rio. It has become our favorite hotel. The staff is very friendly and helpful. The location is very good, near shopping and near Copacabana beach. The rooms are spacy. The bed is very good. Safe in room. Free internet access (cable). Arriving after a long night in a plane and in airports, it was a very positive experience to be taken care of by the hotel personnel. The breakfast - (lunch/dinner for us) - made us comfortable. However, we assume that the hotel is observed by robbers. Obviously we were followed by a group of experienced robbers when we took a walk to the Avenida Atlantico. Few people were around, but suddenly we were attacked and robbed. No people reacted, not the local police, nor the beach vendors. To get more guests in the future, I suggest that the city of Rio - sponsored by Copacabana Hotels - would take actions to reach "no-tolerance" levels when it comes to robbery. This time it was no blood-shed, but possibly that potential was there hidden in the background. 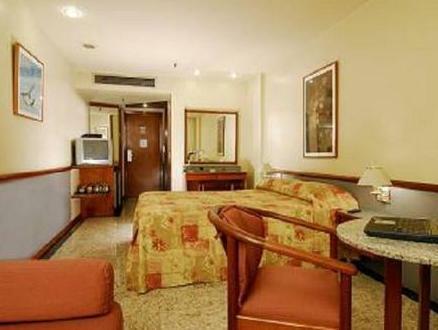 This was my second stay in Merlin, Copacabana hotel, and I will recommend this hotel for other users. The location is fine, only 3-4 minutes walk from the Nortehrn Part of Copacabana. Its also restaurants nearby, a good one only 100 meters down the street. Through the tunnel, its only a 5-10 minute walk to a shopping center. The hotel has a friendly staff. Hôtel avec un très bon rapport qualité prix, grande chambre par contre nous nous sommes retrouvé avec deux lits double au lieu d'un grand lit. Propreté correct mis à part un peu de calcaire, par contre chambre très vieillissante avec des prises ou raccordement électrique pas trop top. nous avons choisi cet hôtel grâce aux photos d'agoda, malheureusement la réalité ne correspond pas du tous. l'hôtel est bien situé est cela est vraiment son seul atout . en effet la réception est quelconque , la propreté date d'hier. je ne vous parlerai pas des prix pratiqués exorbitants pour ces chambres sans intérêts aucun. si peut être une chose positive les caïperinas de la piscine sont à recommander. je suis conscient que les prix des chambres à rio sont prohébitifs mais quand même!! !